Do you own or run a business in the greater Phoenix region? It’s too easy to neglect your HVAC system when you’re busy taking care of the day-to-day operations of a business. Unfortunately, failing to take care of HVAC maintenance tasks in a timely manner can have severe repercussions, potentially leading to a shorter lifespan for your heating and cooling system. Avoid costly future repairs or having to do a new HVAC installation earlier than you expected; take care of your commercial HVAC maintenance needs now to keep your climate control system running smoothly for a long time. 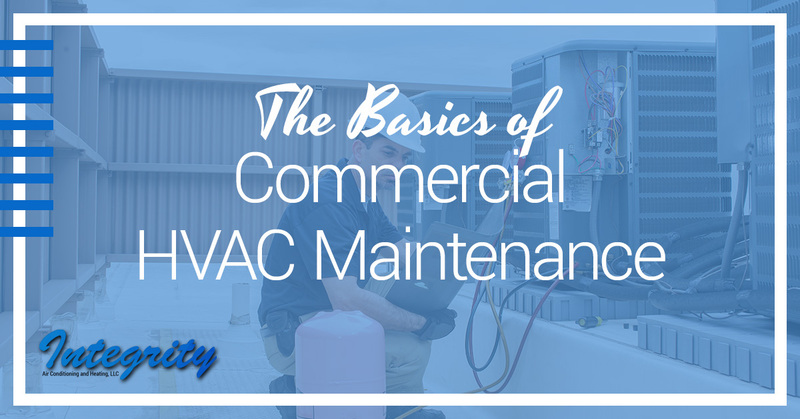 Read on to learn the basics of commercial HVAC maintenance. How Often Does Commercial HVAC Equipment Need Servicing? That’s a good question, and the answer depends, to some extent, on the size of your business and the type of HVAC system you have. In general, it’s a good idea to have HVAC contractors check and service your heating and air-conditioning equipment at least once a year. This includes inspecting, cleaning, and doing minor maintenance and repair tasks (as needed) on your units. If it’s been a while since someone has serviced your HVAC system (or you can’t remember the last time you even thought about your heating and cooling units! ), give Integrity Air Conditioning And Heating a call today to make your commercial HVAC maintenance service appointment. For a lot of people, the HVAC system is a big unknown. It’s a mysterious set of miscellaneous parts and equipment that, collectively, keep people comfortable indoors. When you’re running a business, you really can’t afford to overlook your heating and cooling system; comfortable employees are happier and more productive. Filters: Dirty filters are the worst! They lower your energy efficiency, make your equipment work harder than it has to, and lead to indoor air pollution. Filters need to be changed frequently. Coils: A trained HVAC technician needs to clean the indoor and outdoor coils to maximize the system’s efficiency and increase the equipment’s life span. Pumps: These also need to be cleaned by qualified HVAC contractors. Failure to perform this important maintenance task can lead to part and equipment failure. Furnace: This large piece of equipment moves air from the heat exchanger to the ducts. It needs to be inspected annually. Heat Exchanger: While it’s part of the furnace, it’s considered to be a separate component that needs close inspection to ensure proper functioning. Refrigerant Tubes: Leaks cause the system to malfunction and can cause health complications. Thermostat: Even the most fine-tuned HVAC system will not work properly for you if your thermostat is on the brink of malfunctioning! Ductwork: If air is escaping from gaps in your ductwork, your system is operating inefficiently. These are just some of the parts of your commercial HVAC system that may need service. Every unit is different, and our trained HVAC technicians at Integrity Air Conditioning And Heating know the differences between brands, enabling them to look for, find, and address any issues known to be more prevalent in specific HVAC models or designs. Size: A commercial HVAC system may be considerably larger than a residential one. Location: While your home system may be at street level or in the basement, it’s very possible that your commercial HVAC system is running along the ceiling of your building, or it may located in a dedicated utility room or backroom. Packaging And Design: Commercial systems are often packaged differently, with varying distributions of major components. If you look at a residential and a commercial system side by side, you’ll notice some distinct differences. Capacity: While your home heating and cooling system is designed for a few rooms and a nominal square footage, commercial HVACs are often high-capacity systems responsible for controlling the climate in a large space with a variety of rooms, from small offices to large conference rooms, and even larger storage spaces. Therefore, outputs and capacity vary greatly between a commercial and a residential system. Drainage: While a small pan may be enough to catch any moisture produced during condensation at home, a commercial HVAC system produces significantly more moisture, requiring a more complex drainage strategy. Because your commercial heating and cooling system is not like the smaller, simpler system you have at home, it’s important that you have qualified HVAC contractors perform the important HVAC maintenance tasks that will keep your system running smoothly now and well into the future. If your business is located in or near Phoenix, Arizona, give Integrity Air Conditioning And Heating a call to schedule your next commercial HVAC maintenance appointment. We’ve been doing business in the area for over 26 years, helping homeowners and business owners alike through quality HVAC service delivered with honesty and integrity. We can also help you with AC installations and ductwork analysis, for both the residential and commercial sectors. Don’t delay; reach out to us today for all your HVAC maintenance and repair needs!